I suppose there are a few of you that don't care for basil, but for the most part, this is one of the most popular herbs around. It's easy to grow, comes in several varieties, and adds such zest to food that it's one of the most-used herbs in cooking. But the ultra-cool thing about basil is the amazing bonus it brings. Basil isn't just for cooking. This herb is loaded with health benefits and from busting stress to clearing your skin, basil has some serious mind-body benefits. Let's talk about skin first. Did you know you can clear up that breakout with basil? Extensive research shows that the essential oils in basil help combat the bacteria that causes pimples. 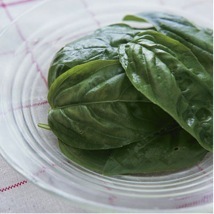 For instance, boil a handful of fresh basil leaves in 1 cup of water for 10 minutes; let the liquid cool. Squeeze any liquid out of the leaves and toss them. Then dip a cotton ball into the liquid, pat it on your breakout zones, wait 10 minutes, then splash with water; repeat this routine once or twice a day. And how about stress? The more help we have with that, the better. Basil can mellow you out. "Basil has anti-anxiety effects," explains botanist James Duke, PhD, author of The Green Pharmacy. It contains phytochemicals that scientists say lowers cortisol, a hormone secreted when you're tense. Researchers found that one effective way to mitigate ever-present stress on a harried day is to add several crushed or bruised basil leaves to your iced tea (2 or 3 leaves per serving). The bruising allows the leaves to release their essential oil. Let the mixture steep a few minutes, then sip away. Speaking of stress, let's talk PMS. (Off the subject, sort of: Do you know why PMS is called PMS? Because the term "Mad Cow Disease" was already taken. Ahem. Not funny, guys.) Anyway, medical research shows that you may want to eat more basil during that time of the month: The herb is a super source of iron-a little more than 2 cups of chopped fresh basil leaves or 1 tablespoon dried provides 10% of your daily value, making it on par with spinach. Eating it during your period can replenish some of the iron lost when you menstruate, says Dawn Jackson Blatner, RD, author of The Flexitarian Diet. Jackson suggest sprinkling some sliced basil over chopped pineapple to combat bloat. And we can't overlook detoxification. Research also shows basil is a super detoxifier, especially for the liver. Pesto, by the way, is considered one of the healthiest foods you can eat and does a very thorough job of cleaning up internal messes. Who knew something so yummy could do so much good? 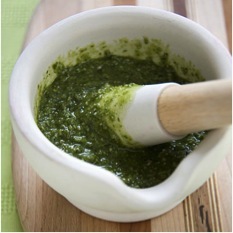 · It's virtually calorie-free -- a quarter-cup serving of chopped basil contains just two calories. · It's low in sodium. 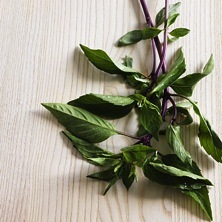 Using fresh basil to flavor your meals makes it easier to skip fatty or salty seasonings. · It's a generous source of Vitamin A. A quarter-cup of chopped basil boasts a vitamin A content of 559 international units. This provides 24 percent of the daily intake for women and 19 percent for men, recommended by the Institute of Medicine. · It contains Vitamin K, which activates proteins needed for healthy tissue growth -- including cartilage, bone, stomach and lung tissue. It also plays a major role in helping your body form blood clots, and works to prevent abnormal bruising, internal bleeding and blood loss. Each serving of fresh basil offers 44 micrograms of vitamin K -- roughly one-third of the daily intake for men and one-half of the daily intake for women. · Finally, basil contains lutein and zeaxanthin, nutrients that benefit the eyes, helping them filter light and preventing damage caused by harmful light exposure. Eating basil has been shown to reduce the risk of age-related macular degeneration.